Historians date this house to about 1790 when it, and much of Hudson Center, was a part of the farm of Henry Hale. This became the home of Reuben Greeley about the time of his marriage to Joanna Merrill in 1817. From that time until 1962 this home was occupied by Reuben or a member of his family. After Reuben’s death in 1863 his son Daniel continued to live here with his wife, Joanna, and daughter Edwina. Edwina married John Wentworth and in time ownership was passed to their son Nathaniel. Nathaniel married Jesse Gilbert of Windham who resided here until her death in 1962; after which the Baptist Church purchased and remodeled the home to be used as a parsonage for their pastor and family. The parsonage has been located here at 234 Central Street some 53 years. 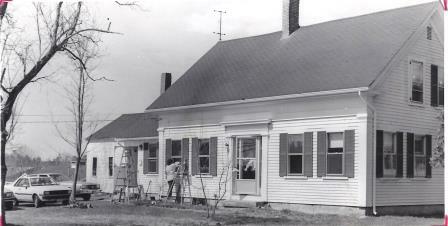 In this c1980 photo church members are washing windows and cleaning exterior of the parsonage. Photo courtesy of Hudson Baptist Church. By Ruth M Parker in Center, Central St, Greeley Interest on February 5, 2015 .